These paintings were each done on business card sized Arches 140# cold press. The paper is a joy to work with. I found it easier to control the paint, and not sure why, but it’s definitely harder to produce runbacks than it was before. I still have a long way to go with watercolor and with florals, but I’m enjoying the journey. Beautiful! 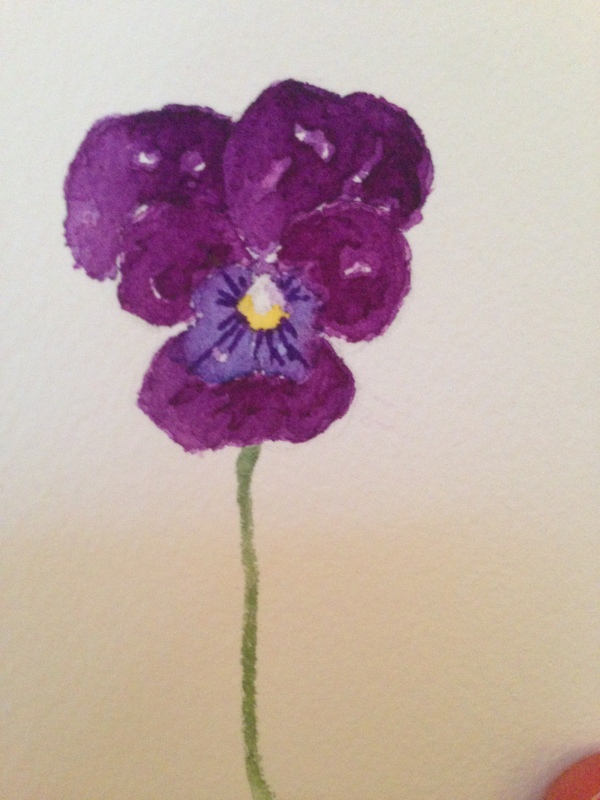 Love the pansy. I’m looking forward to trying sunflowers. Happy Thursday! That’s a beautiful velvety purple you’ve used there – nice job. I so enjoy my photography, and especially photographing flowers, but do so enve your ability to paint. That is something I cannot do. Heather, I never could either. I’ve been persistently working at art since last September. Mainly because it won’t let me alone. Admittedly, photography has never called me that way, as it’s called you. You could always buy a crayola set at Walmart and give it a try, see if it’s speaking to you. It’s fun to play with color, I think. C, do you have any thoughts on how I could improve these? I don’t wanna get too frustrated before I’ve begun. I like these very much. The second one I really like the density of color that indicates the petals. Very nice. Thanks, Kirk. I have a loooong way to go, it seems. And I think in the pansy, I left too many white sparkles. I tend to overdo a good thing sometimes. I’m glad you like the rose. I wasn’t sure whether I should even post that one. 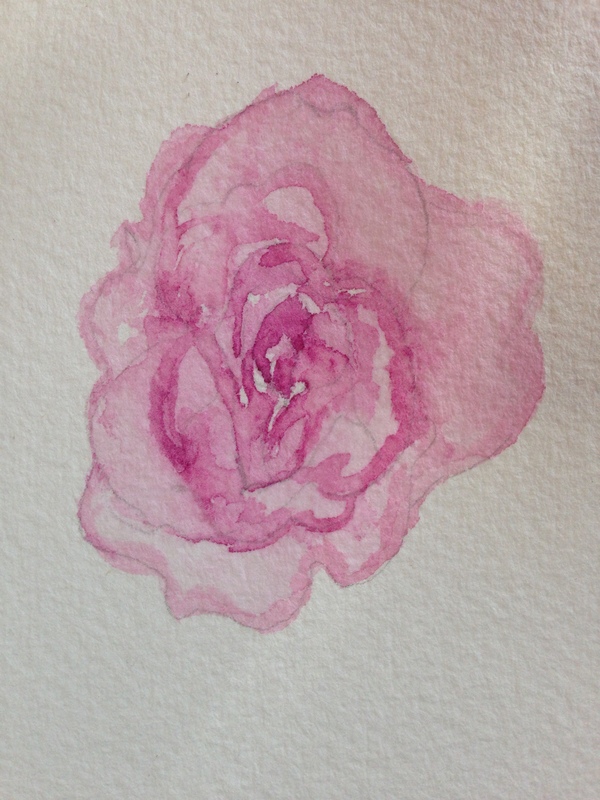 I definitely got lost in the petals, but I was determined to try a WC rose after the cp drawing. Saw some yellow pansies this morning…one of my favorite flowers. These are like small portraits. They’re my absolute favorite (the viola). That’s a neat way of thinking of them, like small portraits. Can you suggest anything I could do to improve them? I wouldn’t do too much–maybe a leaf–the simplicity is what makes them so effective. Aw, thanks. I did think about a leaf.. The reason it’s harder to make runbacks is probably because the paper is thicker and more textured. Just so you know. Probably the more the paper is textured, the more it will grab at the watercolor. The paper I’m comparing to is also 140lb with a strong texture, but it’s a good bit less expensive. More $ doesn’t always equal more quality in my experience, but in this case it does, I think. how right you are that there are rewards for working small. personally (and every painter is unique) I prefer Arches Hot Press Aquarelle Paper 140 lb. for working small because it has no texture, and absorbs the pigment nicely. but every time a painter changes to another paper, there is a need to understand how it responds to pigment. my procedure is to get my pigment(s) ready, then put a clear water wash over the whole paper and drawing. I wait and keep checking the paper until the sheen of water has been absorbed and the paper is damp but only just. that’s when I go in. keeping the paper somewhat moist the whole time helps prevent harsh, hard edges. then, when you are happy with that first go-round, and the paper is allowed to dry, that’s when detail can be added to the dried painting–very carefully and with just a tinge of pigment, to bring the depth of the flower into focus. remember that these are just ways one painter does things–and how you will achieve effects will become your own. don’t get frustrated because a watercolourist has to sort of adopt the temperament of a golfer–patient forbearance (smile). Thank you very kindly for those tips; I do appreciate them. Yes, I have a feeling this whole process may be a patience lesson for me. It’s always been a struggle for me to have patience. Maybe that’s why WC draws me in so much. I think its lovely, the color spot on..
the best things come in small packages or small pieces of watercolor paper….lovely lovely flowers!!! no….I think you just need to keep painting…what you are doing is lovely and if it brings you joy….I learned in sketchbook school today that it is okay to copy your idols, mentors…..cause you learn so much and your own style will definitely come through…it is the process of finding the style that appeals to you….. Thanks, Rebecca, I appreciate your time. I learn so much from you and the other artists here. I watched a video (again) from Joanne Boon Thomas doing sunflowers in her loose, beautiful fashion, and it made me wanna try something similar. Irmgard Rawn also has one on roses in the same kind of style. That kind of thing will prob be my next WC, but I’d like to be able to render flowers more realistically too. I prob would choose the loose style, but I’d like to be able to do either one, if that makes sense.